^ 1.0 1.1 1.2 澳大利亚国脚蒂姆·卡希尔正式加盟绿地申花足球俱乐部. 绿地申花官方网站. 2015-02-03 [2015-02-03]. ^ Sherry, Max. 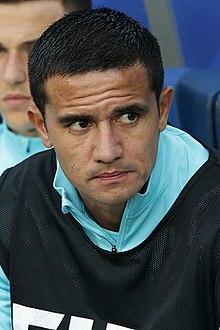 Tim Cahill signs for Jamshedpur FC in the Indian Super League. Perth Now. 2018-09-01 [2018-09-03] （英语）. ^ 「頭鎚王」卡希爾未言休，宣佈加盟詹謝普爾. 球迷世界. 2018-09-02 [2018-09-03] （中文（香港）‎）.